Cloud Storage is now popular technology, which allows uploading and saving our files on internet. We can access and use these files on any computer and any place if you having an internet connection. This is going a secure way to store personal data, secret files and any of your data. Such companies like Microsoft Skydrive, Dropbox and LiveDrive providing particular cloud storage space up to 25 GB. Only Microsoft Skydrive provides 25 GB free storage to its users. Some of the online services giving limited functionality only and after they ask users to upgrade their account. BeeCloud offers a free unlimited cloud storage offers for webmasters and bloggers. 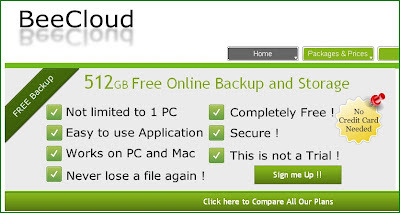 If you have a website or blog, write one post about BeeCloud Backup’s free offer and give backlink to their website. For this you must already have a free 512 GB backup account on BeeCloud. See more BeeCloud webmasters offer. The features are truly awesome... very nice.